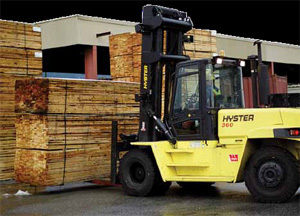 Most lumber sawmills, reman mills or lumber container stuffing companies consider forklift equipment as “a necessary evil”. Every dollar spent acquiring, maintaining or operating this equipment comes right off a company’s bottom line. These days, every dollar of profit counts and so in the lumber business, regardless of your particular market niche, if you’re looking to make more money, reviewing your forklift equipment is a great place to start. With forklifts, always remember, less is more. So, how do you really know if you have too few, too many or just the right number of lift trucks? Let’s take a look at the five most common “red flags” that should tell you something is wrong. First, does your company have any idea what your fleet utilization percentage is by truck, by department and for the fleet as a whole? If not, it would be wise to take the time to figure this out. For years, many lumber companies have had an approach of just replacing one forklift with another forklift instead of going through a proper justification process. Remember, with each unnecessary forklift comes unnecessary costs by way of the lift truck itself, maintenance, the operator, operator training, fuel, insurance, potential liability and so on. Second, what is the average age of your fleet and what percentage of your trucks are over five years old? Sometimes companies have too many units because their fleet is too old and they need a greater number of lift trucks if they are to avoid downtime issues due to a higher-than-average frequency of repairs. Other times, they have an excess of forklifts because the lift trucks are too old to keep up to production demands dictated by highly sophisticated sawmill machinery that has become exceedingly more productive these days. Whatever the reasons, an older fleet will often have excessive costs. It’s important to be on top of these costs to make sure pro-active decisions are made by choosing the right time to upgrade before operating costs, productivity or safety targets are compromised. Third, how many different types of forklifts do you operate? By this I mean different specifications such as capacity, fuel type, mast, carriage, tires and so on. If every forklift is different, it usually means that each forklift is too specialized to work in other areas around the mill resulting in a limitation of how utilized this asset will become over time. Fourth, does every forklift have a working hour meter? A working hour meter is one of the most critical parts on a forklift. It has to be functional 100 per cent of the time. Without a working hour meter, you can’t properly calculate equipment utilization, properly plan maintenance intervals or decide on when an asset should be retired. I’m always amazed at how many non-working hour meters exist today. Fifth, is it obvious during the course of a day, that forklift operators are getting on and off the equipment multiple times leaving the truck to sit there idling endlessly leaving you with the false impression (based on hour meter readings) that the asset is fully utilized? Watch your work flow at different times of the day to see what is happening. Keeping your operators on the truck and moving as much as possible should be the goal with every lumber business that operates forklift equipment. For whatever reason, forklift trucks seem to attract less attention and scrutiny than other types of heavier mobile equipment or production machinery. However, spending a little time in this area will convince you that “there’s gold in them there hills”. 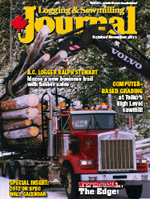 Let’s look at a very simplistic example where a sawmill has just one under-utilized 25,000 lb. capacity surplus forklift in their fleet. By getting rid of this truck and all the related costs that go with it, and by finding creative ways to spread its work elsewhere, the company will likely save well over $250,000 in the next five years. Who wouldn’t be interested in that? Take the time to investigate and explore your options in this area. You’ll be glad you did. Scott McLeod is President of Fleetman Consulting Inc. He is available at (604) 614-3530 or via his website at www.fleetmanconsulting.com. Fleetman Consulting Inc., based in Surrey, B.C., is an independent forklift consulting company that specializes in forklift fleet management and forklift procurement, representing the interests of the end user.